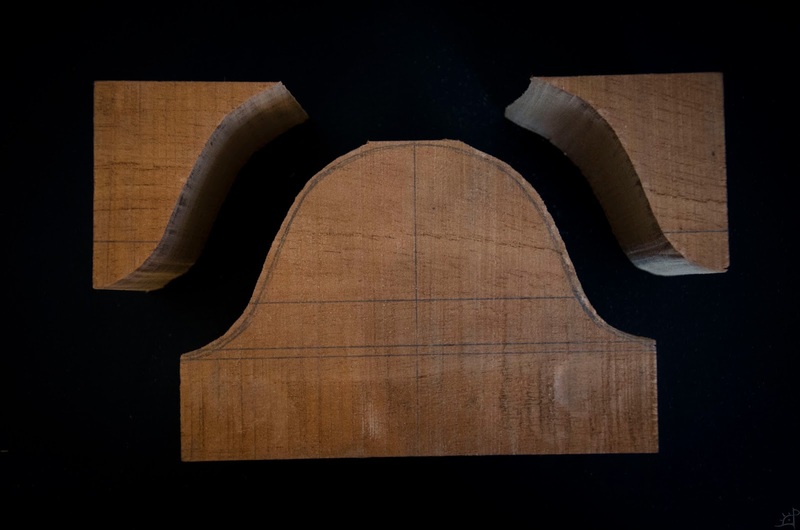 For this mandola/guitar project, I knew that getting the sides bent and assembled would be immensely time consuming given the limited space available to work in. What I did not anticipate was it taking three and a half months. 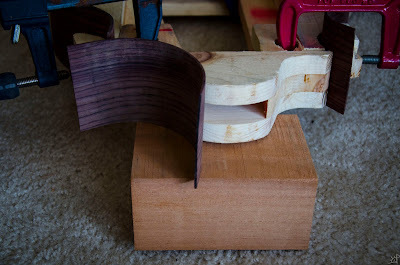 Between the trial and error of the steam bending, the building of two presses/frames for the shaping, and the actual putting together of the sides, it has been a wild ride that has taught me more about clamping strange angles and small pieces than I ever hoped to experience. Fortunately, the sides are finally assembled, and I can lay this chapter of the build to rest. 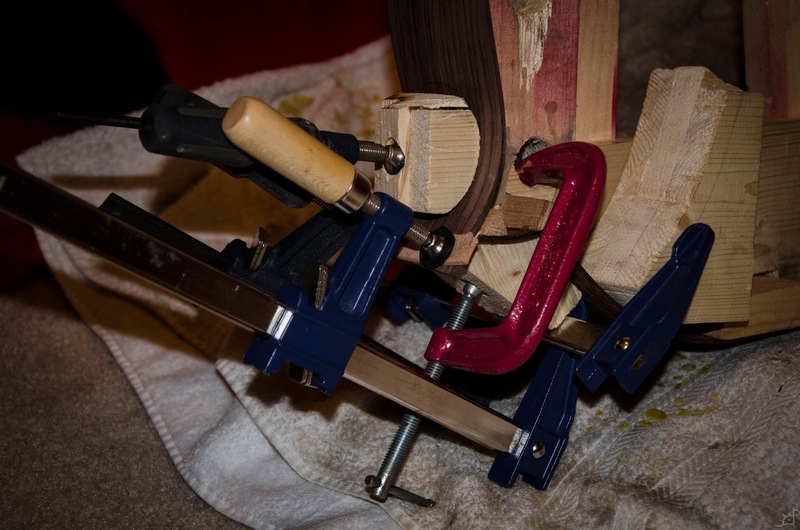 Although it does not look like much, and is a bit crooked from the asymmetric relaxation of the bending on the two larger members, the feeling of having it sit there unclamped and in one piece was fantastic. Now, getting to this point. The first order of business was to figure out the shape of the neck block. Because of my inability to bend a compound curve into the top pieces without breaking them beyond repair, I went through a handful of iterations on what to do with it. 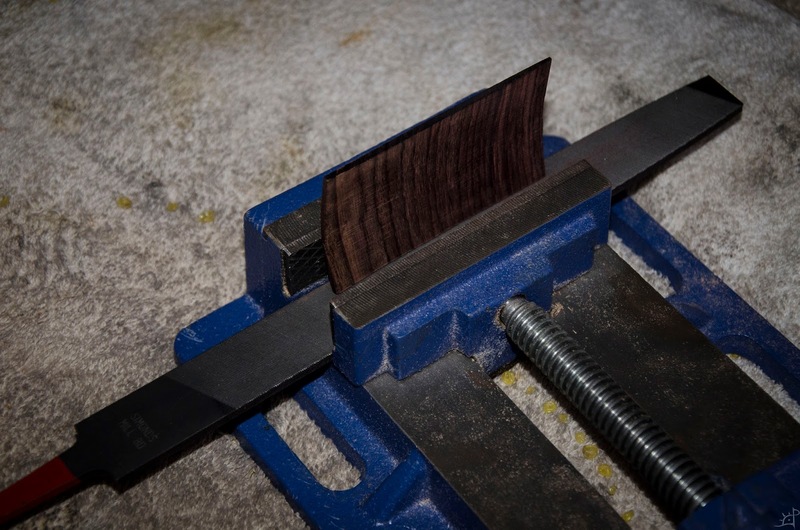 At first, I thought it would be a good idea (it was not) to end the rosewood partway up the shape of the block, adding a few separate bands to ease the transition of wood species, and then blend into the neck itself. This seemed like it would work out, but the more I thought about it, the more I did not trust the grain of the Spanish cedar to hold from chipping while cutting and carving space for the inlay. 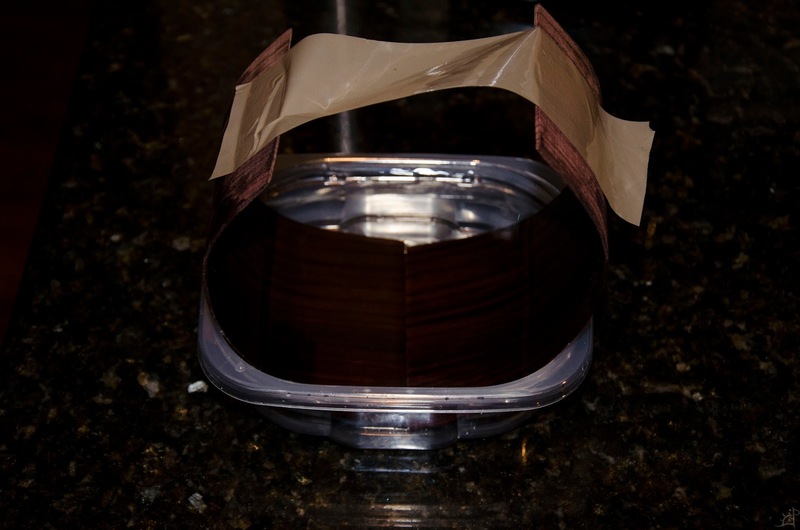 Eventually, I decided to try and thin the top pieces enough that I could do a regular lamination. The cedar would hold all the structural integrity, jacketed by the thin layer of rosewood. 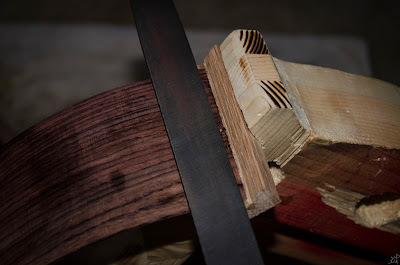 Where the ends of the rosewood would not join with the neck block, and were already bent, I would leave at full thickness. But first, the shape itself. 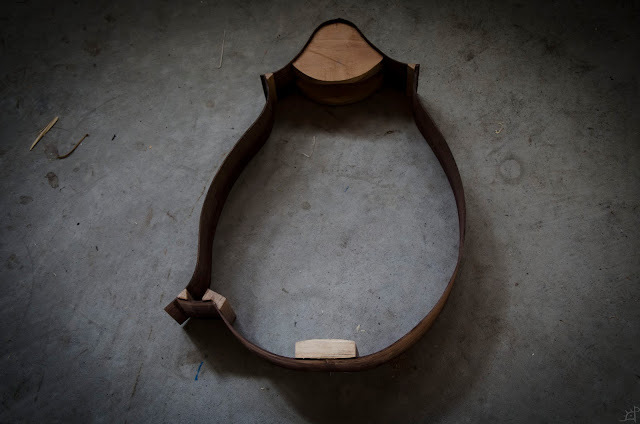 I traced the neck of the frame I built a while ago, planing three faces and using the square to make it as symmetric as possible. 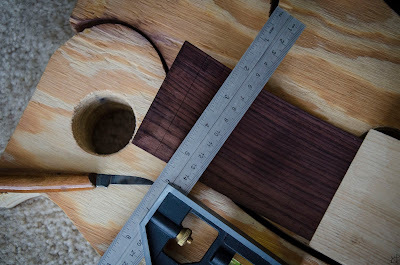 Because the neck block was a strange dimension for my purposes, I had to sacrifice a bit height from the sides, but that also allowed me to remove a few of the problem grain areas from bending. Either a bandsaw or a scrollsaw would have made this much easier. 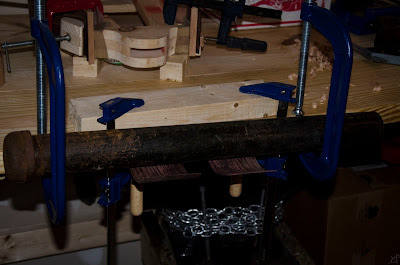 Instead, I had to make do with a coping saw, the block clamped to my desk. 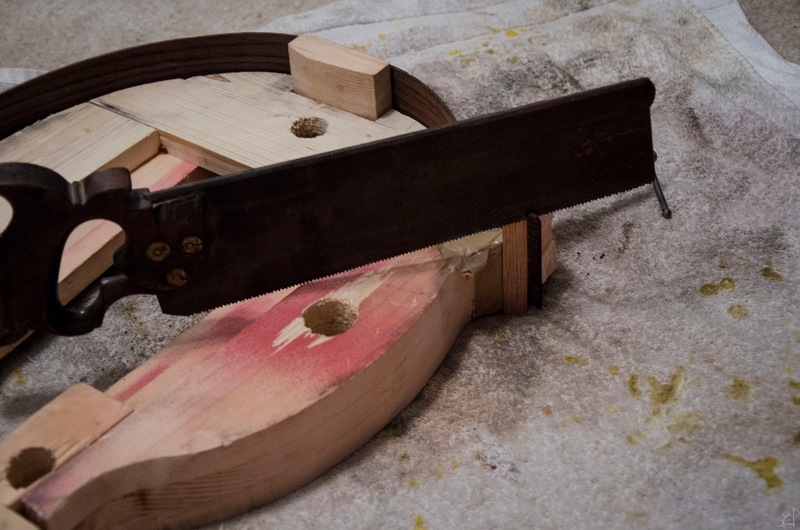 Despite only having about an inch of travel in the blade, it cut without too much difficulty, the largest problem being trying to keep the blade perfectly vertical. After the first cut, I checked for square, and although not perfect, it was better than I expected. 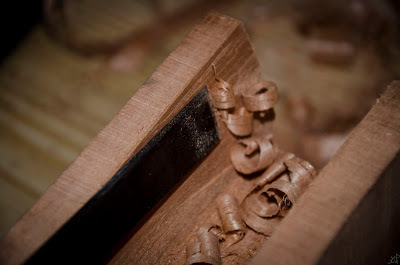 Due to the length of the cut, however, there is a bit of swell near the middle that I will need to clean with chisels. 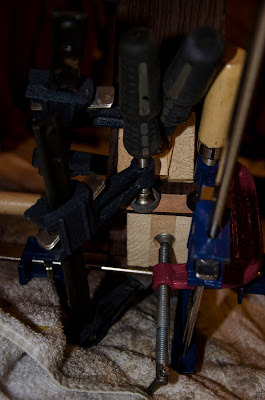 Because of the relatively arbitrary shape, size, and orientation, I left a bit of excess as room for error. Fortunately, the grain was very respectable and took the chisels well. 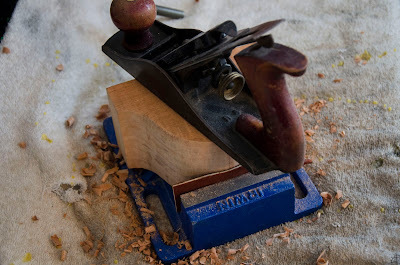 Blending the curves took the final shape down close to the lines in many places, and through a combination of the chisels, card scrapers, and a block plane, the resulting shape was pleasing. Whether or not it is what it should look like, I have no idea. Never having seen the inside of any stringed instruments before, everything from here out is a total guess. 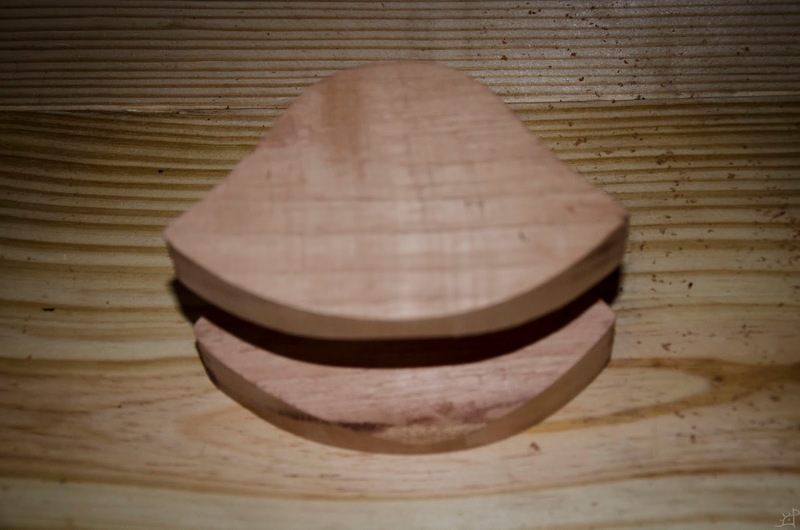 Before going any farther with the sides, I planed the two opposing faces and removed any jaw marks from the vice. I figured that it would be easiest to remove any excess material now as opposed to when it has the sides attached to it. The area where the curves come together at the top will need to be solid for when I cut the dovetail for the neck, but the rest is just excess weight. More on this later when I have a better idea of how it will fit with the sides attached. Now, onto the actual sides themselves. 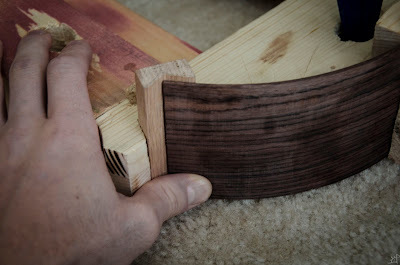 Here, I am adjusting the thickness for it to join with the heel block. 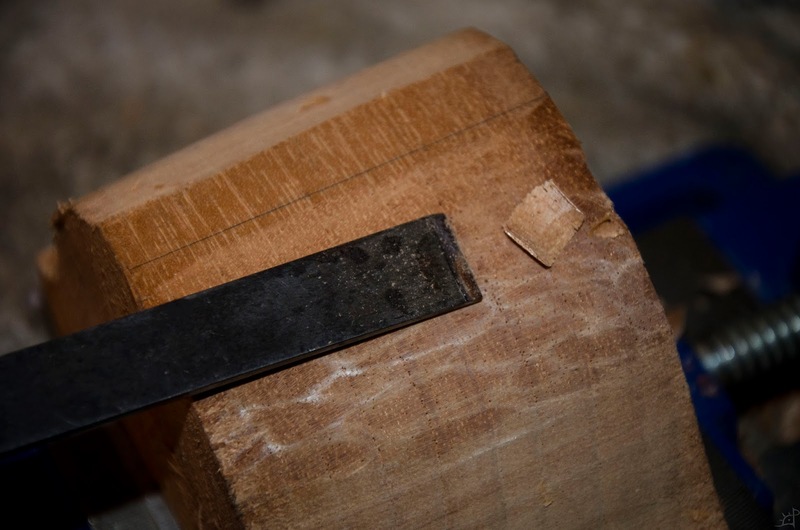 There was a bit of snipe from thinning it down, and that prevented the two pieces from meeting flush. 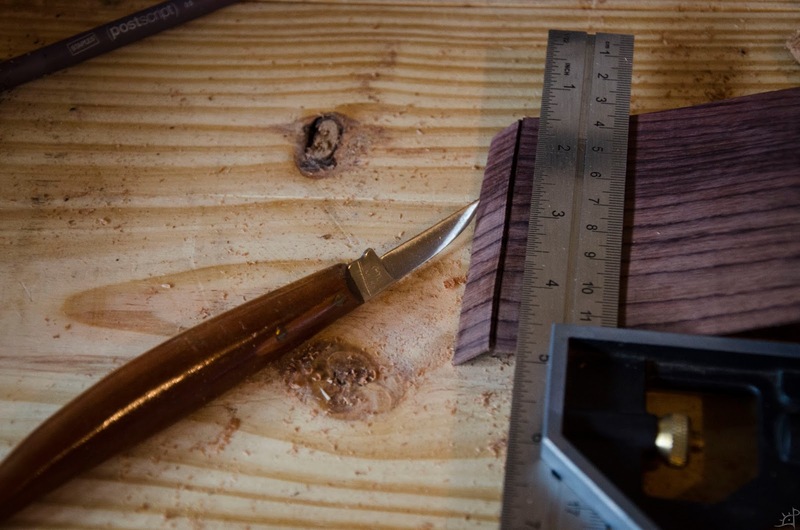 Squared and planed, the two pieces meet at a satisfactory joint. All my dreams of using the frame built in Part I were dashed when I tried to get everything in place. 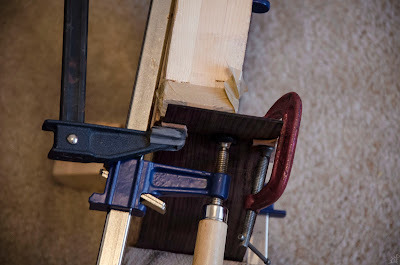 Simply put, there was too much extra bending involved to get the length of the sides to align for the frame to be handy. Instead, I used a load of clamps and some string to tension the ends into full contact along the joint. 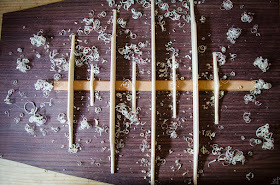 That first seam was the easy one, as neither of the two pieces depended on any others. Now, every length needs to be much more precise, square, and plane. 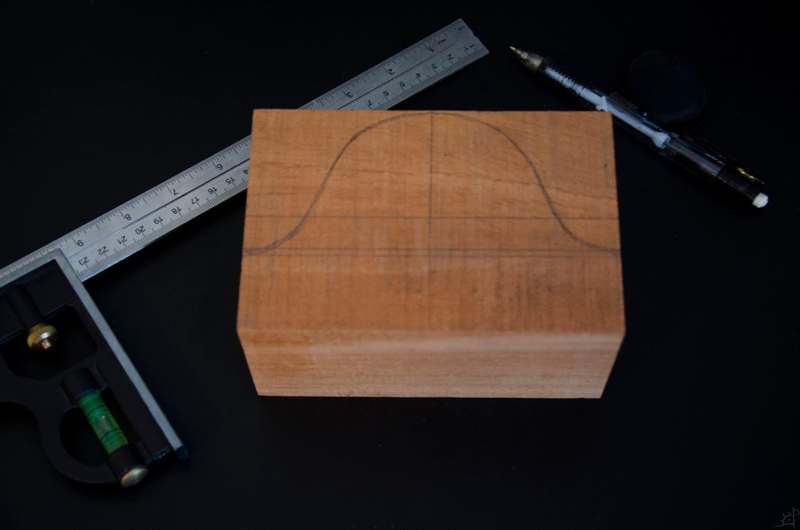 For measuring lengths curves of different radii, I could have used a cloth measure, but I only had a bit of string, so I used that and measured against the square's ruler. Before, I used the backsaw to make these cuts, but I found that the wood is thin enough that it prefers to break and splinter rather than cut, so I just scored it on both sides as deeply as I could and carefully broke it free. 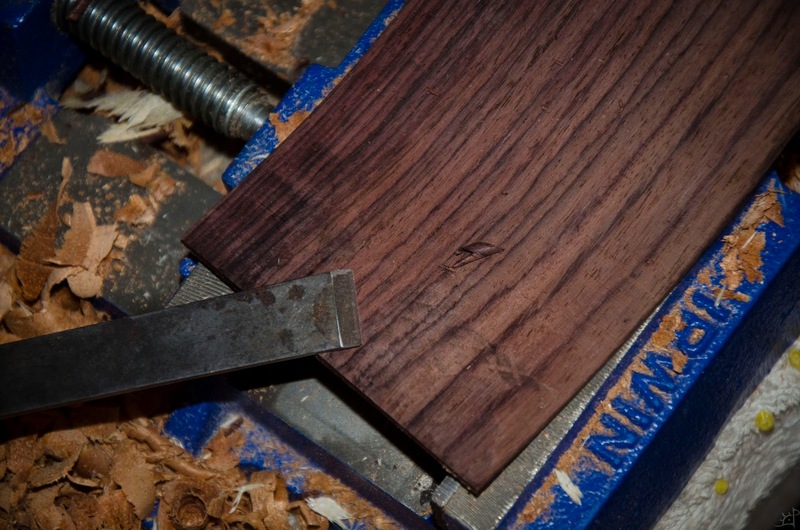 The result was a much cleaner, square cut that needed minimal cleaning. Checking the fit with the inner corner block. This was the most difficult to align but the easiest to clamp. Or rather, the only easy one to clamp. 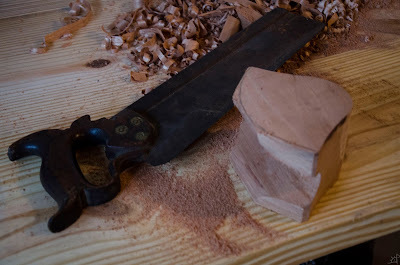 Early on, I decided it was worth the hassle of finding and trimming scraps of leather to use as a buffer between the hard clamp jaws and the wood, but unfortunately, the situation became a bit more complicated later. 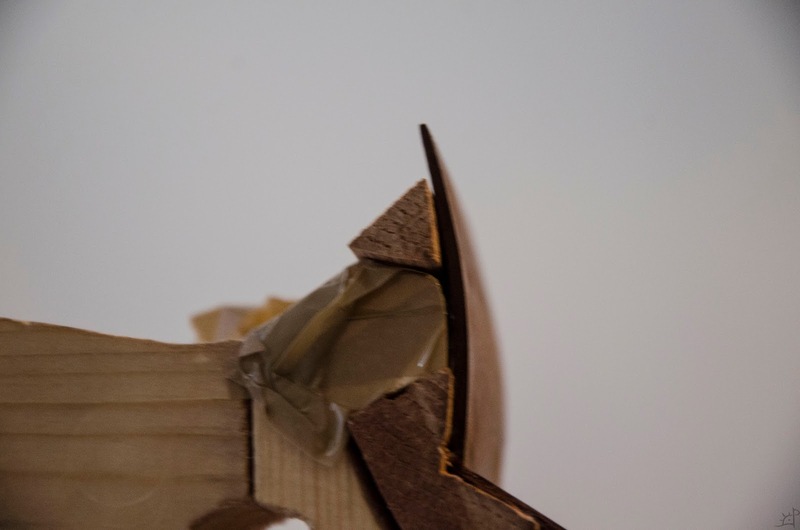 Also, you can see a strip of packing tape behind the joint, which is to prevent the glue from sticking the sides to the frame. 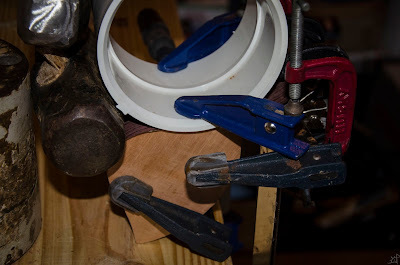 PVA glues do not like to stick to that smooth of a surface, which makes it handy to have lying around the shop. 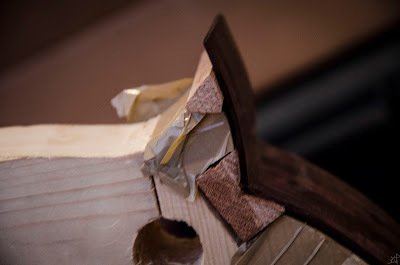 In order to set the edge bevel angle for the next piece of the inner corner, I used a jig similar to those used to remove the burr on card scrapers. In essence, it is a metal vice that holds a file perfectly perpendicular to the card scraper's edge, but here I used the width of the file as a way to set the consistent angle. However slight, it made a significant difference with the fit of the joint. Before gluing the next piece, I had to make true the surface it was being attached to. A bit of file work, and it is as flat as can be. Clamping. More glue, more tape. 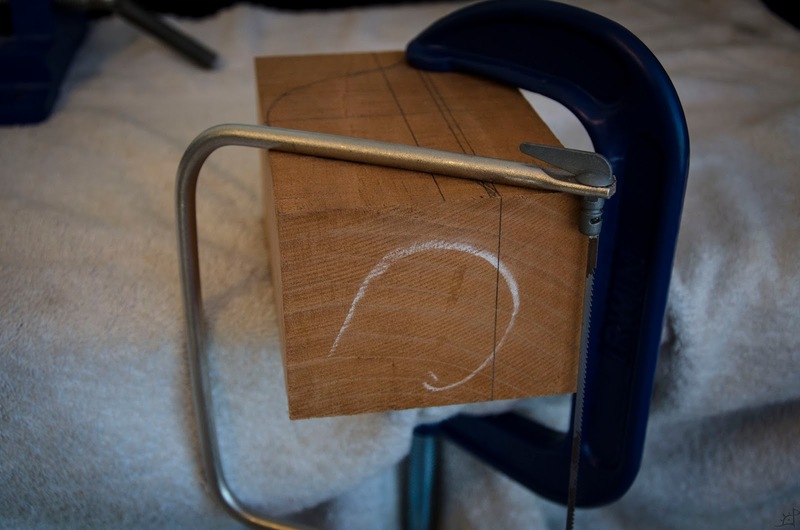 If you would recall those small bits of wood I made in Part I, the first of which used in the inner corner, the shape was a loose estimate of what it would need to be to match the curve of the bent sides. Above, you can see that it is a bit off, there being a hole in the bottom right corner. 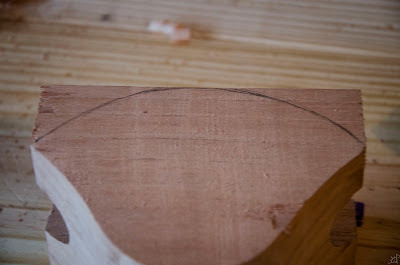 Same as before, I planed down the shape to match the new angle. A bit out of focus, but much better. I should also note that these blocks are longer than the height of the sides. I did this for the obvious reason that the sides are more important and therefore these corner supports are sacrificial, but it made for some complications later on, which will be addressed in Part V.
With that support glued in place, I trimmed down the excess, trying to match the angle as closely as possible, but leaving it a bit proud so I could file it down the remainder of the distance rather than having to risk planing across the scandalously thin end grain as I bring back the support piece. 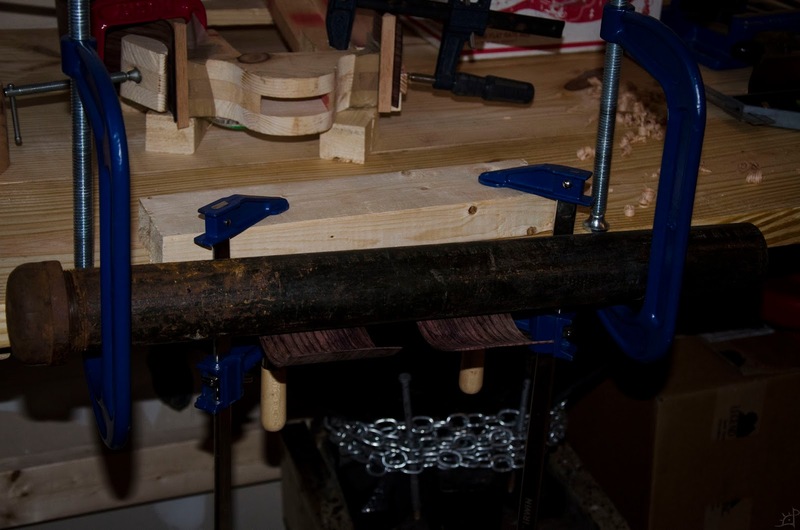 This was where the interesting clamping business began. 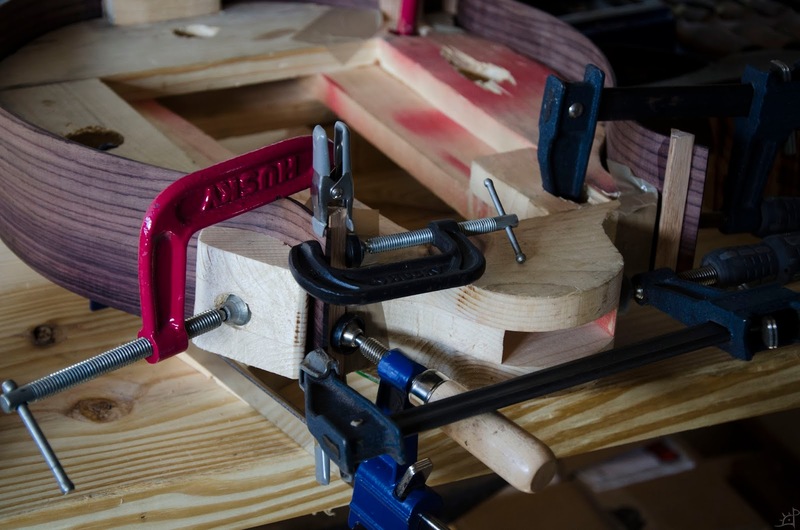 Because of the angles, the tendency of one piece or another to slide out of place, and the weird shape of the frame interior, I often had to use clamps in random places upon which other clamps would then use as an anchor for one or both of the jaws. And, which will become a bit more clear, I routinely ran out of space despite needing to apply pressure to additional places. Side view. 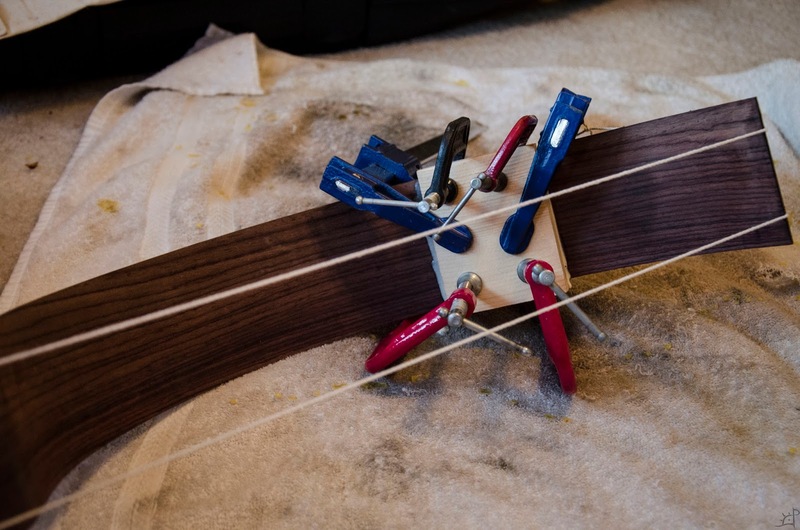 To accommodate the frame being thinner than the height of the sides and the aforementioned shape, I was forced to use anything at hand to my advantage. 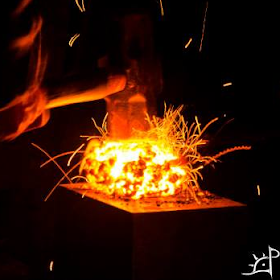 Blocks of wood from the press, hammer heads, pipes, anything at all. And here a change of scenery! 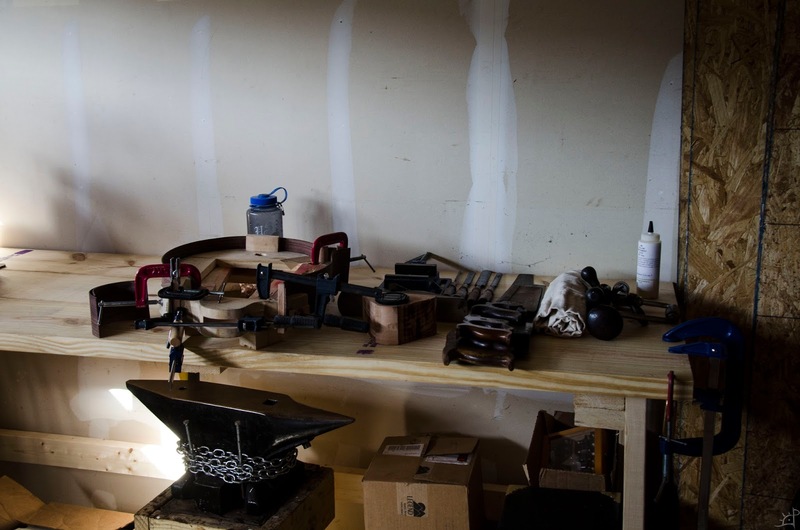 Earlier this month, I moved out of the old apartment and into a house that has a garage. Despite the move on two days' notice, it was well worth the hassle for the workspace, although admittedly the most difficult and space consuming parts are (hopefully) done with. 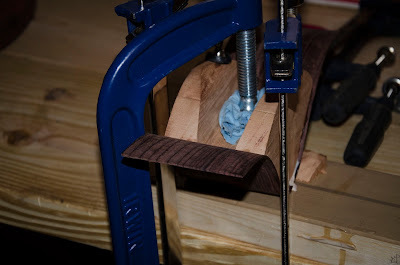 Attaching more of the corner supports. Although not the most difficult on the first side, it was a bit inconvenient to have to wait an entire day between each of these assemblies. 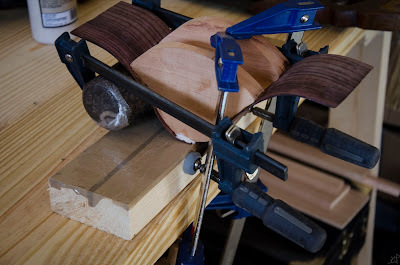 If I remember properly, there were twelve or more individual joint configurations to glue, which absorbs the days rather quickly despite needing only a handful of minutes to set the glue and clamps. Right then, back to the neck area. The remainder of the joints are set, but I have yet to do something with the neck pieces that have been taunting me the entire time. 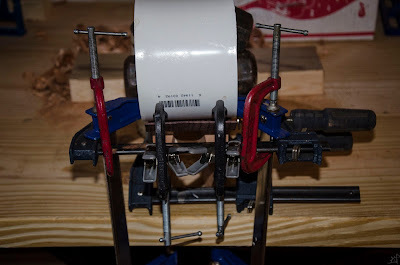 I decided that I would thin them down as far as humanly possible (while retaining its consistency and integrity) and bend them cold around the neck block. 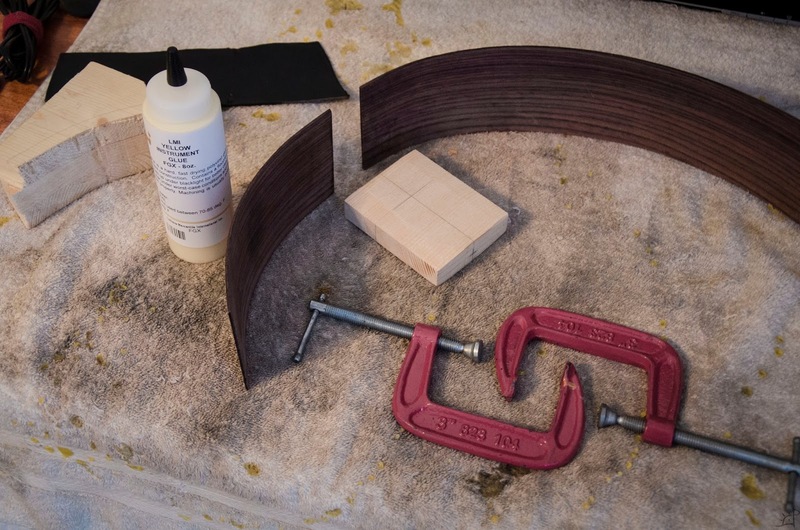 After soaking for a few hours, they were a bit more pliable, and so I began carefully relaxing the excess curve that carried over in the wrong direction from the previous bending. 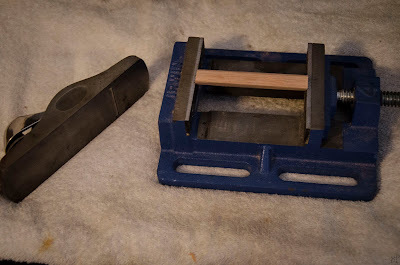 Since I dislike waiting and had only a few unpacked tools beyond what I have been regularly using, I used an old iron pipe (also used as a hot mandrel in the steam bending) as both a weight and a rough form for the curve I needed. Close enough. 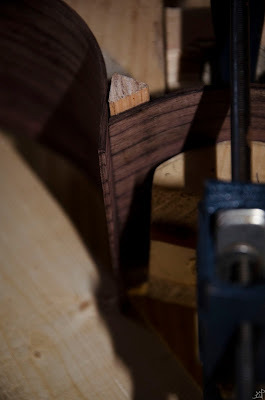 That recurve at the top is what was just bent, and what was thinned down to about ,4mm average. Due to this thinness, I was able to clamp it down and use glue to hold it in place. 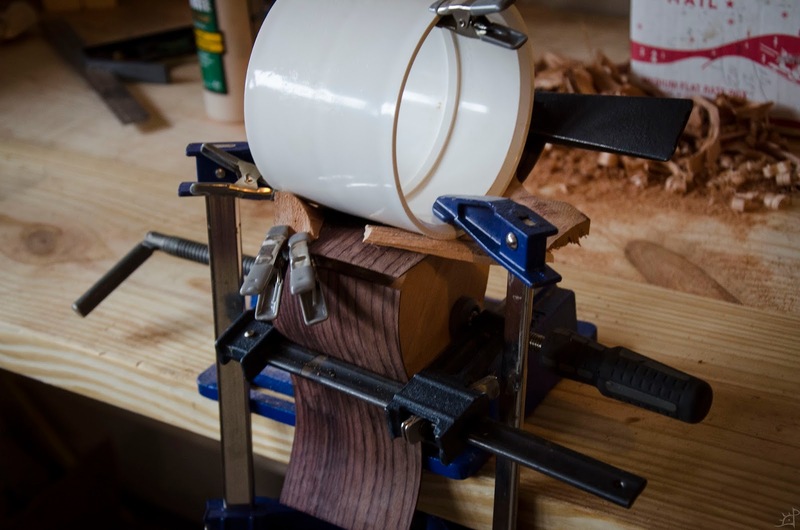 While I would rather not have had to do this, I will also be cutting the dovetailed neck in such a way that it holds those ends down mechanically so I do not need to rely solely on the glue for its future integrity. 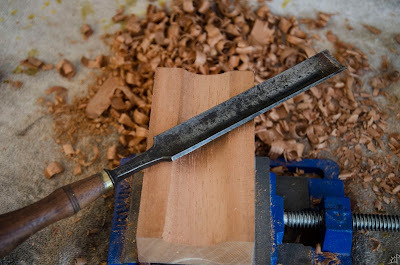 With this shape, I was able to trim the last bits off the neck block. Spanish cedar is a relatively light wood, but there was no sense in keeping around the extra weight for no reason. I marked on both ends where the rosewood curve diverged with my present shape, and removed it. Instead of continuing to use the gouges to hollow out the block, I cut out a considerable amount and used the chisels and gouges to refine it and clean the saw kerf. A little better, a bit more blended, and a lot lighter. How this will affect the acoustics, I have no idea, but it looked nice so I went with it. 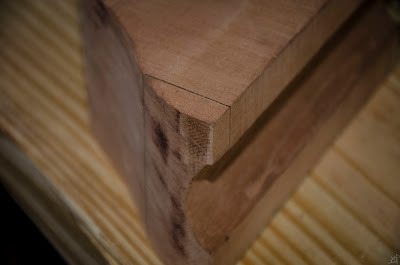 I arbitrarily used the edge of the cut ends as a depth stop, figuring it was safer to have that meat leftover to support the neck. 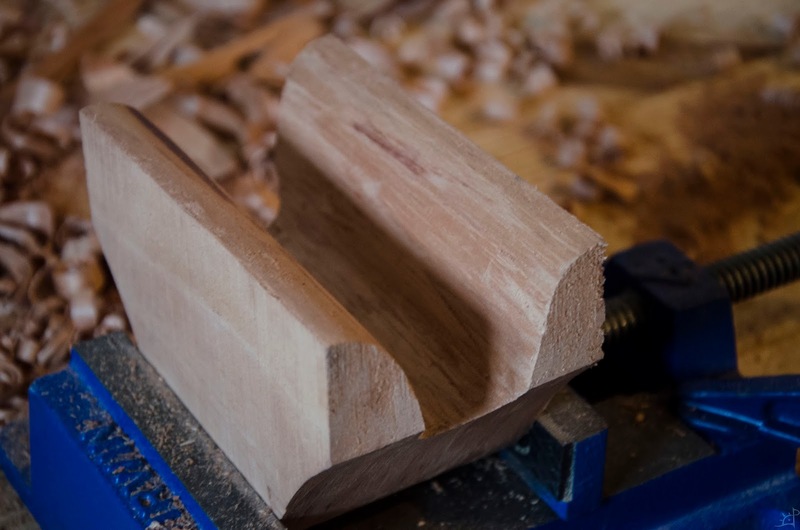 Where the sides diverged, there was still that harsh transition into the body, so I drew a curve that will leave no corners anywhere the neck block joins to the top and bottom. Draw knife later. 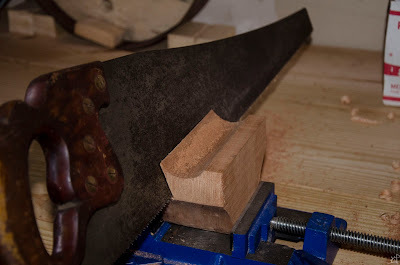 This was a bit on the rough side, not having a good way to hold the block in a way that would not annihilate it or my fingers if the blade jumped. 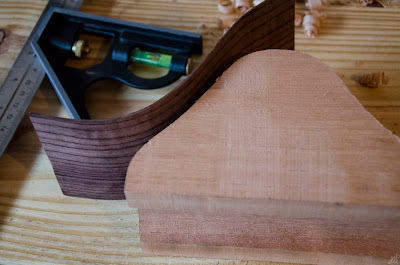 Eventually, the shape was done. 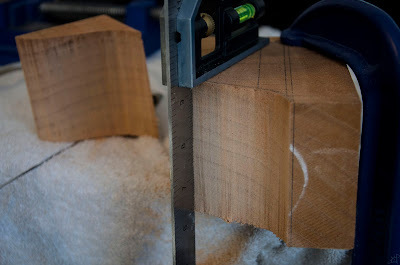 Now that that is over with, I marked the approximate length of the sides and trimmed them. I should note that I joined the neck pieces to the neck block first, due to the unconventional approach to the assembly. Had I bent them closer to the final shape first, I might have built off of the existing assembled sides. 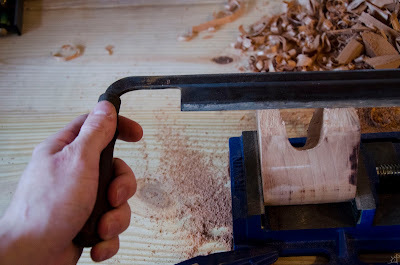 This was by far the most difficult to do, as the shapes were nothing resembling square in any side. All the curves made one piece slip, another turn, another fall loose. It was a mess. One less clamp, and everything fell apart. 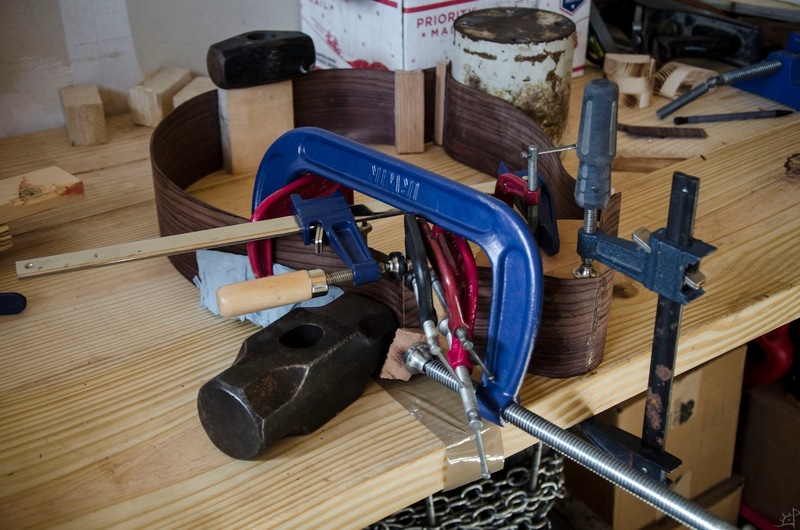 That saying that you can never have too many clamps is absolutely true, but it is just as important to have diversity in the sizes of clamps. Each of the two mirrored pieces was done in two parts, one to glue the thicker side (opposite the neck) and another, once the second piece was on, to glue the thin bit by the neck joint. 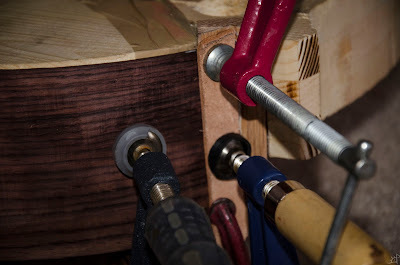 Because of the S curve, there was no good way to clamp it all at once, but with wedges and weights I was able to make it work in two (for total) stages. And that's it! 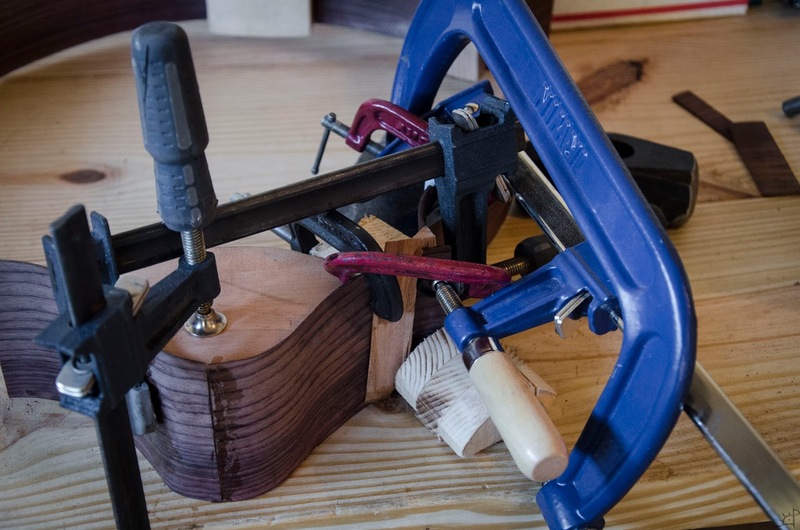 A wild ride of clamping adventures, but worth it in the end. As I mentioned in the beginning, the frame is a bit crooked, but overall surprisingly plane. Next time, I'll be cleaning up the faces to begin assembly of the internal skeleton, and ultimately joining the top and bottom.